The other day everyone I came in contact with was complaining about the weather. It was snowing and around 2 degrees. People were either complaining about the snow, the cold, or both. It's winter in the northeastern United States people. What do you expect... really?!!! Winter, cold and snow come every year. It's certainly not unexpected. When I went outside that day, the beauty took my breath away. 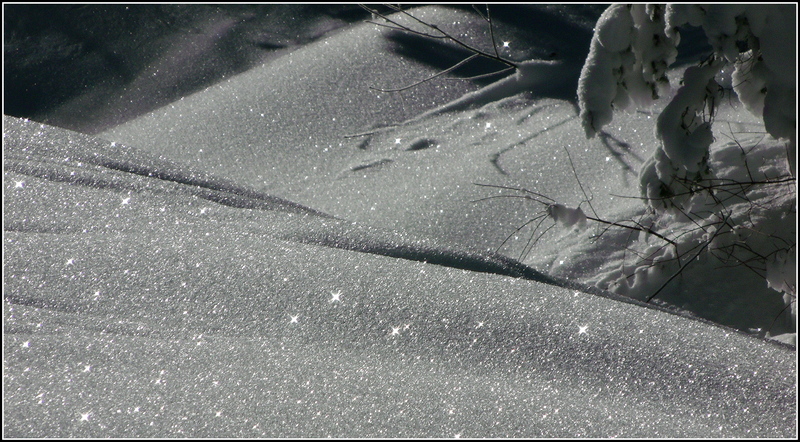 When it's very cold, the snow kind of crystalizes and looks like diamonds scattered across the landscape. Absolutely beautiful! The sun was out and all you could see were sparkles everywhere. It was unbelievable!!! My whole world was like one big Norman Rockwell Christmas card. How could anyone complain when we are surrounded by such incredible beauty? I read, "The only difference between a good day and a bad day is your attitude." That really says it all, doesn't it? We always have a choice to make. Every single minute of every single day we have the opportunity to choose to be happy, or sad, or angry, or upset, or excited. IT'S A CHOICE... OUR CHOICE. It has absolutely nothing to do with what's going on around us. It only has to do with the choice we make about how we respond to what's going on around us. There are gifts for us everywhere. Look for them. See them. Choose them. That day I had a cold. I had a headache. It was cold outside. It was snowing. It was sunny. It was beautiful. I choose to have a good day!